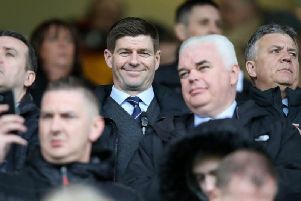 It is the most infuriating scoreline in Steven Gerrard’s short time in charge of Rangers but he will slap it on the dressing room wall at Hamilton today. Rangers have failed to win any of their four away matches this season, but the 1-0 defeat to Livingston was particularly hurtful. As far as Gerrard is concerned, that should be enough motivation for his players to produce the win he demands. “Because if you turn up and play the same way, the same will happen. It’ll be easy on Sunday, the team talk. “For me, Hamilton is very important. Our away from hasn’t been as good as I’ve wanted it, in terms of numbers returned on the board. “I was disappointed with us at Livingston, so I’m expecting a good performance from the lads on Sunday and that’s the only thing on my mind, really. “I think it’s a great test for the players. “They’ve had some criticism in terms of the away form and sometimes in football you have to forget about the nice bits, the tactical side. “Sometimes you just have to go out and do the basics well. Turn up and just empty it for your club and your supporters and more often than not that’ll get you where you want to go. “We’ll have a game plan like we always do. It’s a similar fixture to Livingston and we had a game plan there, but we never carried it out. We never turned up. “So, the players have two options. Go and empty it, do the basics and fight for the shirt and the fans who’ll turn up, same as they did at Livingston. Gerrard said: “The break possibly came at the wrong time if you’re talking about momentum and carrying it through, but you have to respect the fact the lads have played a lot of games. “We don’t use fatigue or tiredness as an excuse but sometimes you do need a bit of blow physically and mentally, just to come away from it for a few days. It is a big week for Rangers – after today’s clash with Hamilton, if they can beat Spartak Moscow on Thursday they will be very close to qualifying for the last 32 of the Europa League. Midfield star Ovie Ejaria has been an influential player m the European run. He said:” If we can perform as well as we can against Spartak Moscow then we can get the three points we are looking for on Thursday. “I enjoy the European games and playing a different style. I had been at Anfield watching Liverpool in the Champions League and Europa League in the past. I had seen what it was like but to actually play in it was something else – I love it. “The atmosphere against Rapid Vienna at Ibrox in the last Europa League game was incredible, especially after we got the second and third goals. Unfortunately for Rangers, Graham Dorrans is facing more time out as other injury issues improve for Rangers. Gerrard said: It’s frustrating for everyone at the club but none more than Graham. he’s desperate to be involved. “He’s followed us everywhere to watch us, he’s watched training sessions when he was injured, and he’s threatened to come back and looked really good. “But he’s had a bit of a setback so he’s not in a nice place mentally right now, he’s frustrated.